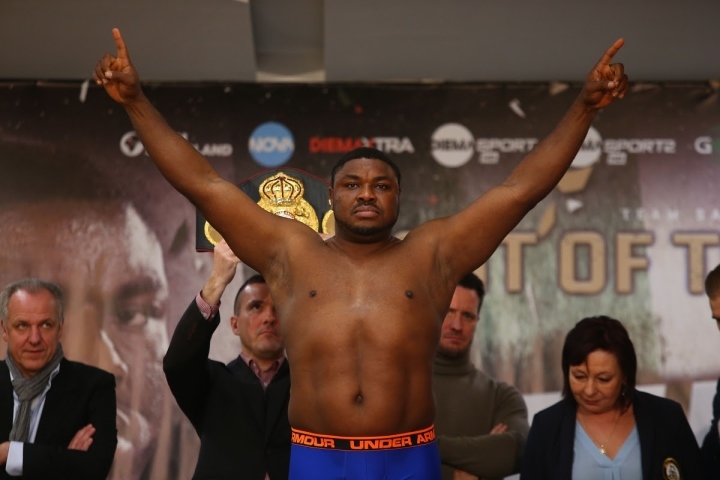 ATLANTIC CITY – The last time Samuel Peter came to Boardwalk Hall, “The Nigerian Nightmare” knocked down Wladimir Klitschko three times in a foul-filled heavyweight elimination match Peter lost by unanimous decision. Thirteen-and-a-half years later, Peter failed to finish the job again, this time against a far less accomplished opponent. Mexico’s Mario Heredia overcame a third-round knockdown and won a questionable split decision over the former WBC heavyweight champion in an eight-rounder on the Claressa Shields-Christina Hammer undercard. Judges Eugene Grant (77-74) and James Kinney (76-75) scored the fight for Mexico’s Heredia (16-6-1, 13 KOs). The other judge, Alan Rubinstein, scored seven of the eight rounds for Peter (79-72) at Boardwalk Hall’s Adrian Phillips Theater. The second fight of Peter’s comeback came against a considerably better opponent than he fought February 23. The 38-year-old Peter (37-7, 30 KOs) knocked out Gerardo Escobar (2-22) in the first round that night in Tijuana, Mexico. Heredia, 26, has lost by knockout or technical knockout five times. He also went 2-5-1 in his previous eight fights. Before beating Escobar, Peter hadn’t fought in the two-plus years since Kubrat Pulev stopped him after the third round of their December 2016 bout in Sofia, Bulgaria. Peter dropped Heredia in the third round, but Heredia survived and came back to make the rest of their fight very competitive. The former WBC champ appeared tired throughout the second half of their bout, but he managed to hurt Heredia with another right hand toward the end of the sixth round. Heredia held and moved his way to the end of the sixth round. In the seventh and eighth rounds, Heredia continued to land right uppercuts and overhand rights. That was enough, apparently, to help him edge Peter on the scorecards of Grant and Kinney. In the first fight Saturday night, Isiah Seldon overcame a first-round knockdown to win a six-round unanimous decision against Bryan Goldsby. An overhand right by Goldsby dropped Seldon early in their fight, but Seldon seemed OK when he reached his feet. The 30-year-old Seldon (13-2-1, 4 KOs) went on to control most of the action thereafter and won by the same score, 58-55, on all three cards. The 37-year-old Goldsby, of Macon, Georgia, has lost nine of his past 10 fights. He’s now 5-10 overall. Seldon, the son of former WBA heavyweight champ Bruce Seldon, fought for the first time since suffering a first-round knockout defeat to Tyler Howard (17-0, 11 KOs) on November 16 in Oklahoma City, Oklahoma. [QUOTE=jreckoning;19656491]Who's ness? Nobody I guess. I miss the Peter of 14 years ago. LOL. [/QUOTE] Oh that's so true "who's Ness? " Who's ness? Nobody I guess. I miss the Peter of 14 years ago. LOL.